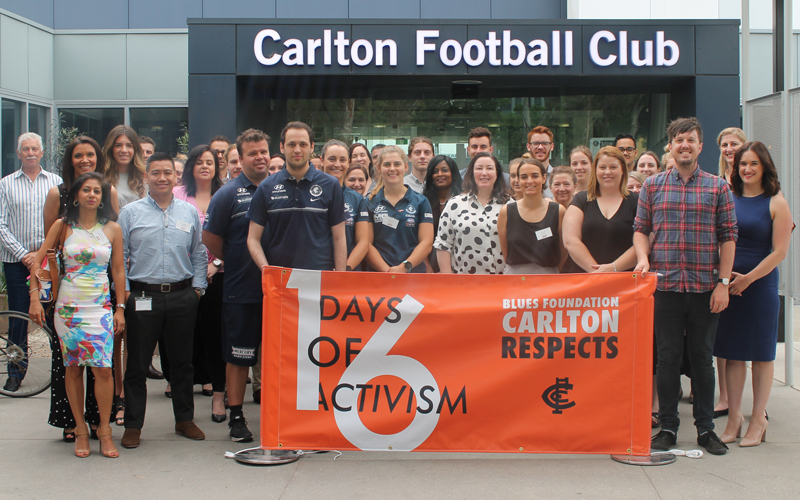 As part of the 16 days of Activism morning tea, Carlton Football Club GM – People, Community, Diversity and Inclusion, Amanda Barker, announced the 2018 CARLTON RESPECTS games, adding the first ever AFLW game dedicated to gender equality for the prevention of family violence. Carlton’s AFL and AFLW players, along with coaches and staff, will be pledging their support towards gender equality – and the Club would love its members and supporters to do the same. To spread the message, make sure you use the hashtag #MoreThanASpectator and #CarltonRespects on social media, and keep a look out for pledges relating to this very important campaign – Carlton players, Blues Foundation Ambassadors and corporate donors will all be getting behind the cause via Facebook, Instagram and Twitter.